I was craving chili the other day, but wanted something different. As you probably know, I've been cutting back on sodium, and trying to add more plant based foods to my diet. So when I was leafing through the April 2008 issue of "Real Simple" magazine (yes I know it's a year old, but when you wait and look at last year's magazines again, they are just like new!!) and saw a recipe for 3 Bean Chili, I snapped it up and gave it a whirl. I went pretty much by the recipe (although it called for a pesto and I was too hungry to be bothered with that, so I just garnished with whole toasted pine nuts, chopped cilantro instead of parsley and some chopped tomato) but added some other touches. 3 Bean Chili from "Real Simple"
Drain and rinse all the beans. Heat olive oil in large saucepan over medium high heat. Add onion and carrots and cook until tender, about 5 minutes. I also added the garlic at this point, and 2 stalks of finely chopped celery (because I had it and I needed to use it). I also added a few glugs of red wine, cuz I needed to finish the bottle before it turned into salad dressing). Stir in tomatoes and 2 cups water, salt and pepper. Bring to a boil. I also added chipotle powder and some home made chile powder, cuz I wanted it to have some heat. Add all the beans and cook til heated through. I let mine simmer at least 30 minutes, so the beans wouldn't taste so canned. 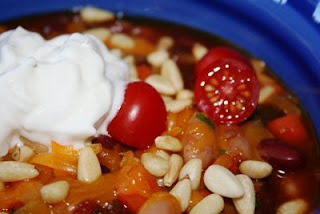 I served this with the pine nuts and cilantro and chopped tomato as garnish- as well as a dollop of sour cream. Along side I served green chile corn bread muffins (a total cheat- Jiffy cornbread mix with added buttermilk and a can of green chiles). Not bad for a relatively quick vegetarian meal. Dev even had seconds. But I will admit that I added a good amount of hot sauce to mine at the table, because it needed some extra zip.